[0:01] <l_r> anev, that's apity ,can you login via ssh? [0:04] <anev> l_r: usb to serial? [2:27] <[Saint]> "At this point we took action to take control back of our panel by changing passwords, however the intruder had prepared for this and had already created a number of backup logins to the panel and upon seeing us make the attempted recovery of the account he proceeded to randomly delete artifacts from the panel." [2:31] <[Saint]> You'd think you'd have offline backups. [2:31] <[Saint]> Lesson learned, I suppose. [2:37] <[Saint]> I would've been tempted to take the "Do you worst, I'll suspend services and spend the time hardening the physical offline backup I surely have, but not before I delete the data you covet off the server myself" tactic. [2:37] <[Saint]> But apparently that wasn't an option for various reasons, likely lack of an offline backup. [2:44] <shiftplusone> plugwash, hello, would you consider updating hostapd to 2.2 in raspbian? the ancient version in debian is quite problematic for many dongles. 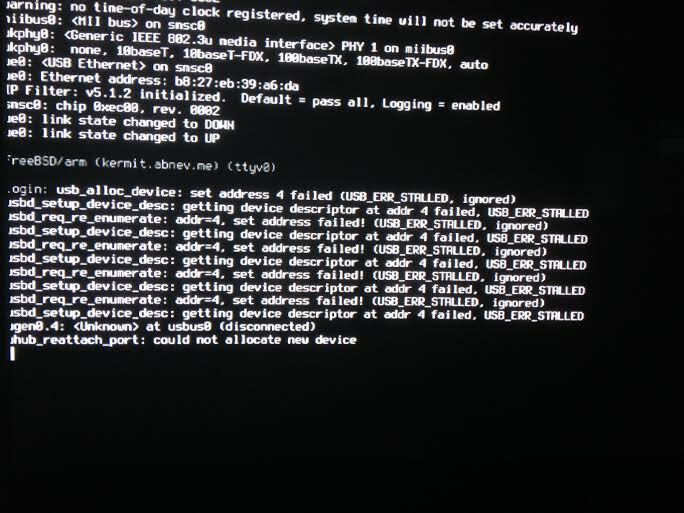 [5:27] <Smrtz|nix> Hey, I'm trying to set a static IP at boot, and I'm editing /etc/network/interfaces, but it's not setting at boot. Is there anything else I need to do? [5:31] <[Saint]> Smrtz|nix: In my experience, its is WAY more flexible to set up DHCP reservation if your router supports it. [5:32] <[Saint]> DHCP reservation has the advantage of "Just Working", both in the home network, and if you choose to take it outside of the home network. [5:34] <[Saint]> With DHCP reservation pools, you just tell the router the MAC address, the hostname, and the desired address, and any time that device connects to the network it is assigned that particular IP. [5:35] <[Saint]> If you want to setup a static IP the conventional way, it is slightly more involved, http://elinux.org/Configuring_a_Static_IP_address_on_your_Raspberry_Pi will walk you through it. [7:12] <ltedcoai> What's the current pull of a raspberry pi? [7:26] <shiftplusone> from what voltage? [7:26] <kidpools> Hey all. I set up a raid and for some reason can't seem to get it to automount on boot. In fact, after reboot it isn't there at all. Can anyone spare a minute and help me out? [7:27] <swiss> ltedcoai: is it from your car? [7:27] <shiftplusone> ltedcoai, anything on USB, aside from ethernet? [7:29] <shiftplusone> so i think you should design it with about 500mA in mind, maybe 700mA. worst case scenario, you;ll need to dissipate 10.3W, which is silly. Maybe buy an SMP module. [7:33] <shiftplusone> nuh, building your own is not a good idea. [7:34] <shiftplusone> though I guess all the tricky parts are hidden by fancy chips nowadays, so nvrm. [7:36] <shiftplusone> not really what? [7:41] <shiftplusone> instead of dissipating energy as heat, they step it down by turning it on and off quickly then filtering to clean it up, so you get something sensible. [7:42] <shiftplusone> I'd need to check the datasheets, but I've got to go. Good luck. [10:56] <TheArtist> Hi guys! I am want to buy a raspberry pi but i have some questions! Can i ask them here? [11:00] <TheArtist> will it be possible to setup a full working linux system? [11:00] <TheArtist> What type of packages / programs may not be able to compile/work? [11:01] <TheArtist> I suppose those that have embedded intel asm, but do they exist anyway? [11:12] <causality> gordonDrogon: ta, do you know if the visi mode only allows serial commands for defined objects in the visi program? [11:16] <shiftplusone> TheArtist, it all works. ARM isn't exactly knew, so there are very few things which flat out don't work. Some things may need an extra patch or two. [11:41] <gordonDrogon> causality, I've only ever sent serial commands to active objects, etc. [11:41] <gordonDrogon> causality, I don't know what spe mode is. [11:42] <gordonDrogon> TheArtist, Er... Are you not aware that there already are several "full working Linux systems" for the Pi ? [11:44] <gordonDrogon> causality, I was asked to provide the Pi code to interface to their displays after they'd been programmed via the workshop thingy - so my library does that interfacing - lets you select objects, get notifications when you e.g. click a button and so on. [11:47] <gordonDrogon> causality, right. I never touched that. [11:47] <gordonDrogon> causality, actually, I may have written some tests for it - way back, but my main thing was writing a library to interface with their very high level thing. [11:48] <gordonDrogon> causality, the issue AIUI is that it can generate asynchronous events - ie. a button push. [11:55] <gordonDrogon> I need to get one of those adafruit displays at some point and use it with RTB directly. [11:55] <gordonDrogon> that ought to be a good way to get graphics out. [12:02] <causality> relatively cheap compared to the 2.8" oled module! [13:02] <debichu> http://moso.io/i/sync_supers.png - top process 'sync_supers' is very annoying. i have no idea what it does, but apparently it has something to do with writing to the disk. but why use *that* much cpu? and it just keeps going, and use that much cpu, until i kill it manually. any ideas how to fix it? [13:11] <gordonDrogon> I don't see that myself. what distro, kernel ? [13:17] <gordonDrogon> I don't use raspi-update though. [13:18] <gordonDrogon> hm. let me update a Pi - although I only updated a few days back. [13:20] <ShorTie> maybe a way to cut down on file corruption ?? [13:21] <gordonDrogon> haven't seen that myself for well over a year now. [14:19] <gordonDrogon> no sign of high cpu usage though. [16:36] <rayeshman> can any one help me? [18:06] <BetaSoul> Hey, any one have trouble getting MOC to increase volume? [19:11] <tpw_rules> BetaSoul: how did you get that error? [19:11] <BetaSoul> trying to use CP. I think I may have hosed something when working with the advanced copy binary. [19:11] <tpw_rules> what does echo $PATH say? [19:12] <tpw_rules> (and this is just from typing cp x y)? [19:12] <amitprakash> Hi, can I build the mainline kernel for raspberry pi? [19:12] <amitprakash> If so, what kind of kernel config would I need? [19:13] <tpw_rules> BetaSoul: what about which cp? [19:13] <BetaSoul> And there isn't a Cp binary there. [19:14] <BetaSoul> Wait, there is now. [19:14] <BetaSoul> But cp isn't working. [19:15] <BetaSoul> Wait, found it. Bad bash config for the session. Must not have kicked over on exit. [19:18] <BetaSoul> Yep, that was the issue. [19:18] <BetaSoul> Also, can you use PV to copy whole directories? [19:24] <pksato> amitprakash: why you want to compile kernel? Its is not recomended for end users. If you asking, you are end user. [19:25] <amitprakash> pksato, because I'd like to? [19:30] <amitprakash> pksato, so is it supported? [19:41] <pksato> I never configure/compiled kernel 3.x, some times 2.6 and lots of times 2.4, 2.2 . [20:38] <BetaSoul> Os? Build? Device? [20:38] <shiftplusone> output of lsusb? [20:41] <BetaSoul> I'm with shiftplusone on this. The TP-link nanos are known for having buggy driver released. [20:43] <shiftplusone> do you know how to compile the kernel? [20:44] <shiftplusone> You don't actually need to, I'm just trying to figure out your level of experience. [20:47] <shiftplusone> But I can't verify that the driver is missing from the image right now. Is this Raspbian? [20:53] <bjensen82> BetaSoul: can you recommend a wifi device that provides stable drivers? [20:53] <BetaSoul> The canakit one isn't half bad, but a little slow. [20:54] <BetaSoul> I've just been burnt on the tp-link card/dongles too much recently. [20:55] <shiftplusone> bjensen82, it doesn't matter too much. [20:55] <BetaSoul> That's what I've got in the raspberry pi right now. [23:46] <andrewrk> hey what audio backend does raspbian use? [23:46] <andrewrk> it's not alsa, is it? [23:56] <l_r> anev, so now you have a working fbsd on the rpi?